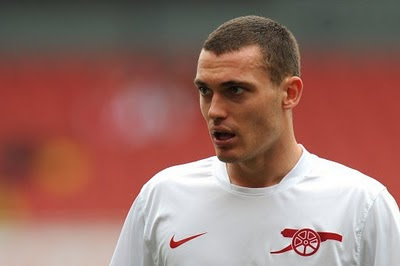 Arsene Wenger has confirmed Thomas Vermaelen has been ruled out of action for the remainder of the season. The central defender suffered an Achilles injury playing for Belgium in a Euro 2012 qualifier in Turkey on 7 September. He returned to Arsenal with the injury and was only expected to be sidelined for ten days. However in January, doctors found out it was a tendon next to his Achilles which was causing him pain which he then had surgery on. Despite resuming training in February, the defender has had six set backs in his recovery. Wenger told his lunch time media conference that the Belgium international wouldn't return in Arsenal colours this season.